If Willie Cruz's background has taught him anything, it's that the world is full of people with wildly varying perspectives. Cruz, a first generation Mexican-American, has always enjoyed working with people of all backgrounds and witnessing the innovation that results. 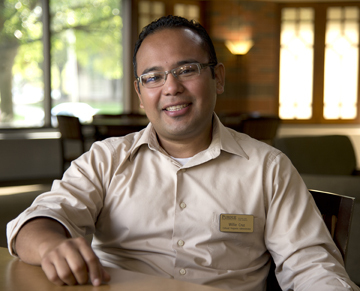 Now, as cultural programs administrator for Housing and Food Services, Cruz works to make sure the division's employees work in an environment that is welcoming to — and benefits from — all perspectives. What are your duties as cultural programs administrator? I'm responsible for developing and implementing diversity training across Housing and Food Services, which is composed of about 800 full-time staff members. For example, we do a panel series each semester called Diversity Lunch and Learn, which invites HFS staff to come listen to student and staff panelists talk about different topics related to diversity. This semester, we have four panels scheduled. We're looking at a variety of issues, including how Native Americans are portrayed by Hollywood and how to work with people who come from different generations. In the past, these panel discussions have been very successful because they provide our employees with an opportunity to engage with the panelists and to ask questions they might not have thought about before. How has your personal background shaped the way you approach your job? I was born in Mexico and raised from the age of 13 in San Diego. My dad was a farm worker and didn't complete middle school; my mom completed some high school but didn't graduate. In my family, there was always the thought that, if my siblings and I could go to college, we could have a better life. However, when you're not familiar with the American higher education system and neither is anyone in your family, it can be difficult to make that happen. I ended up getting bachelor's and master's degrees, but I had to learn a lot of things along the way that many students already knew from the start. Even today, when people ask me about how I made to college, I still have to pause and think. That experience, and now my experience in HFS, really taught me that everyone has different experiences going through life. None of those experiences are better or worse, they're just different, and everyone brings different strengths and weaknesses to the table. I've also learned that treating everyone exactly the same is not always fair -- you have to treat the equals equally and the unequals unequally. That’s a concept I learned in graduate school, by the way. It’s quite powerful. What other projects have you tackled here at Purdue? Four or five years ago, I helped develop something we call cultural nights in our residence hall dining courts. We try to have at least three events in the fall and three in the spring, and they take place in our individual courts. We work with our dining staff to come up with a theme and menu. In the past, we've had a Hawaiian night, an Argentine night, a Native American night, a Lunar New Year celebration and many others. We try to make our cultural nights coincide with wider heritage month celebrations, such as a cultural night to tie in with Latino Heritage Month, Black History Month and Women's History Month. Also, one of the reasons I was brought on board was to help further develop and implement our Hispanic initiatives, which involve looking at this unique staff group's needs. So, each fall and spring, I bring together our Spanish-speaking staff to try to determine their issues and concerns. Their feedback has led to the development of various initiatives. For example, we've brought in local financial experts to give advice in Spanish and we've worked with Human Resource Services to provide information in Spanish about medical benefits. For those going through the process of naturalization -- which I completed myself in 2010 -- we offer resources including putting them in contact with legal experts and providing classes to help them prepare for their English and civics test. These initiatives have helped with the retention of our employees -- something that's very important to HFS and to the University. Both personally and professionally, it's getting a chance to work with people who may not always share my perspective. This not only challenges me to think outside my own parameters but it also gives me an opportunity to assess and reassess my own convictions. It’s that learning element that I find both rewarding and exciting. I know this is going to sound cliché, but HFS really feels like a big family -- we have fantastic employees and fantastic supervisors, and everyone is invested in championing diversity and making sure everyone feels comfortable in their environment. It's a great team to be part of.